So did you all have a relaxing weekend? I had a great time away and will definitely share some photos soon of the gorgeous tree house we stayed in. This week however I thought I’d do something a little different, since the Soccer World Cup starts here on Friday and all eyes are on South Africa. 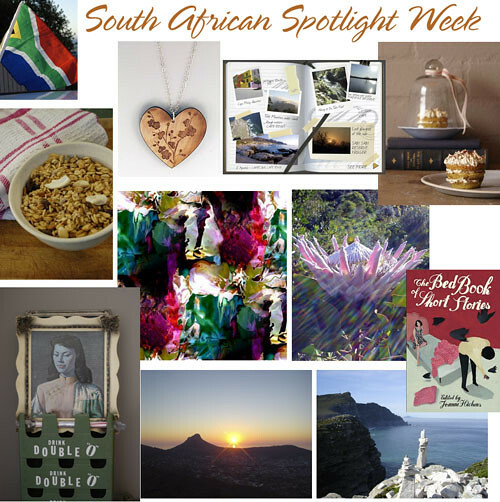 I thought I’d dedicate this week to South Africa and will be featuring great SA talent all week long! Can't wait for all this goodness, Lana! Or to see all your tree house adventure. It sounds so exotic! Look forward to it ALL. I am looking forward to reading these posts… Happy Monday! Lana with her always wonderful compositions of loveliness! And a tree house!?!! I want to hear all about that! Happy new week to you, wonderful friend. Tree house pics will be up next week everyone! I'll email you the details in the meanwhile, Betty! I am loving that wooden heart necklace and I am always up for some yummy treats. Ooh very cool, love the pics!